Jupiter modern copper finish 1 light switched LED wall spotlight, with directional curved lamp head, matching finish lamp support arm and circular wall bracket that incorporates a handy operation pull cord switch. This wall mounted spot light looks modern and attractive on any wall. The classic style fitting is fully adjustable and provides an additional source of light for any room in your home. 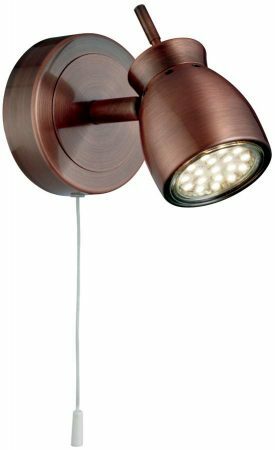 The contemporary antique copper finish is ultra stylish and the wall light also has a handy pull cord switch for ease of use. This highly versatile wall light is a great option for almost any room in the house where bright adjustable lighting is needed and requires an LED light bulb to help keep running costs to a minimum. Other products in the stylish Jupiter lighting range can be found below and include a four-lamp ceiling spotlight, eight-light spot-bar and a matching three light circular ceiling fitting. I am looking for a pair of wall mounted, modern looking, LED directional lights. This is the best I have found. Are there any other colours available ? Hi John, thanks for getting in touch. There are no other colour optins available in the Jupiter range. You will have more choice if you look at all of the spot lights in THIS LINK and any that are not LED can easily be converted to LED by using an LED bulb. Please view the LED bulbs in THIS LINK. If you need anything else please do not hesitate to get in touch again. Kindest Regards, John.